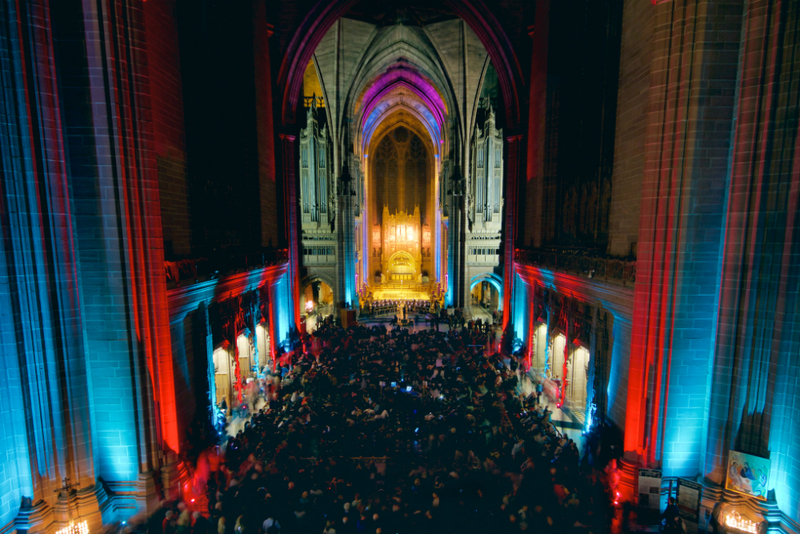 Above: Kaleidoscopic Disturbance at Liverpool’s Anglican Cathedral, by Andy McKeown. Bathing the 175 foot high vaulted ceiling in fragments of coloured projection, McKeown’s tranquil and fluctuating work was accompanied by the cathedral’s chamber choir and orchestra. Hundreds of viewers were asked to lay down on the floor to enjoy the show. 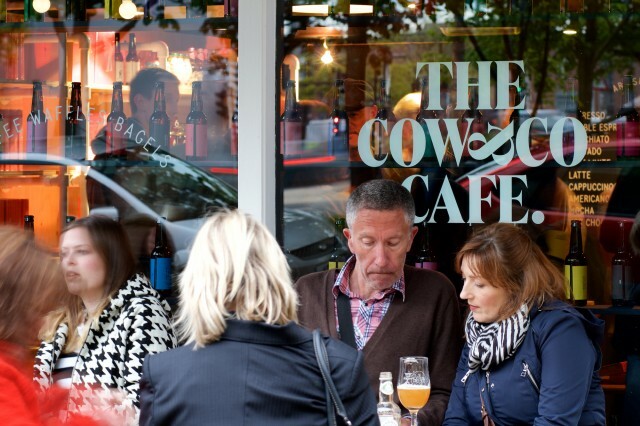 Above: The 100/100 Beer Project at Cow & Co. Café, Cleveland Square, saw SB Studio curate an enticing array of beverages with labels designed by 100 different artists. Each design has been published in a book which is currently on sale, with all proceeds going to ArtFund. 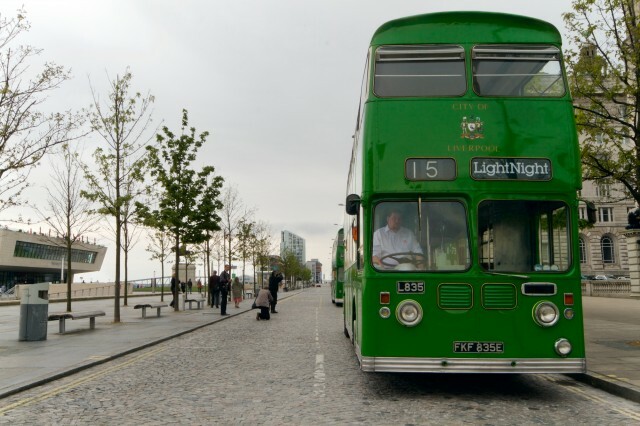 Above: With the weather closing in around the Liverpool docks on LightNight, there was no better way to get about than hopping on the Heritage Buses of Merseyside Transport Trust. Passengers had the chance to travel back in time via this glorious green municipal bus fleet. Above: Did you #FollowTheCake? Artists Kevin Hunt (L) and Flis Mitchell (R) toured the major art venues of Liverpool raising awareness of the Paying Artists campaign; ensuring everyone that they met received a fair slice of the cake. See more on the campaign here. 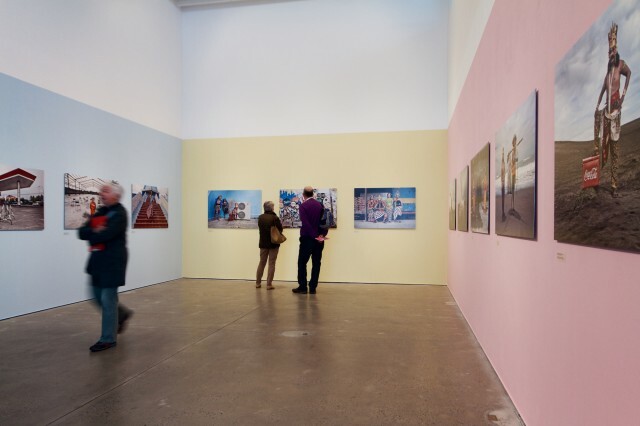 Above: Coinciding with LightNight was the launch of LOOK/15 International Photography Festival, which runs until 31 May and hosts work by an outstanding pool of global and local talent. OpenEye Gallery is one of many venues taking part in the festival and exhibits work from artists Deborah Kelly, Helen Marshall, Louis Quall, Richard Ross and Sonal Kantaria. 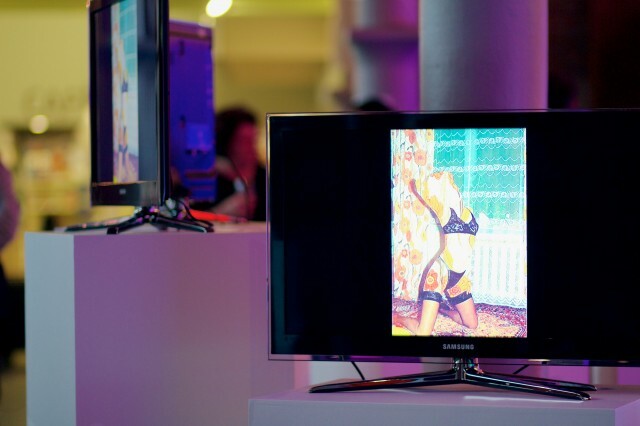 Above: Tate Liverpool was also part of LOOK15 as the official launch host of this year’s festival. Television screens in the lobby presented artworks to accompany DJ Yousef’s musical backdrop, alongside invited VJs live mixing photography. 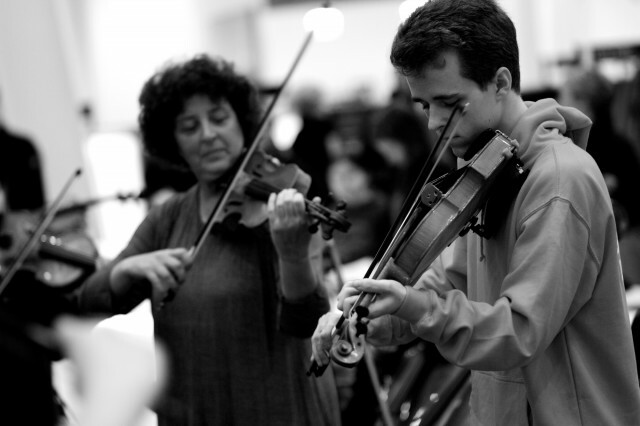 Above: The atrium of Liverpool’s Central Library was filled by the youth string ensemble In Harmony: a programme aiming to inspire the children and families of West Everton to celebrate their community through music. 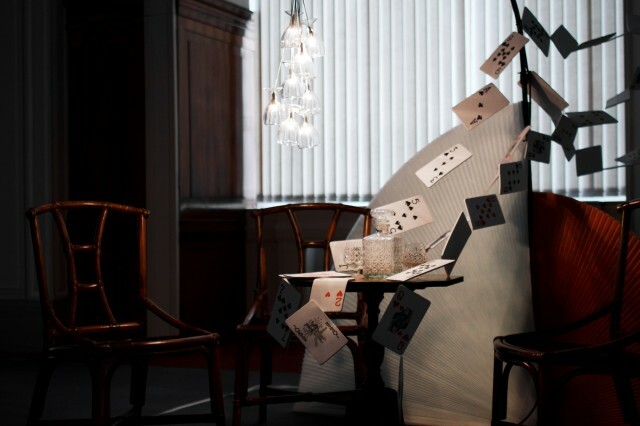 Above: The Cunard Building’s immersive installation transformed the ticket office into a space where visitors could dine with the captain and revisit carefully constructed experiences from the past. Designed by Make Space Create, the work was featured as part of the build up to the arrival of the Three Queens (24-26 May 2015). 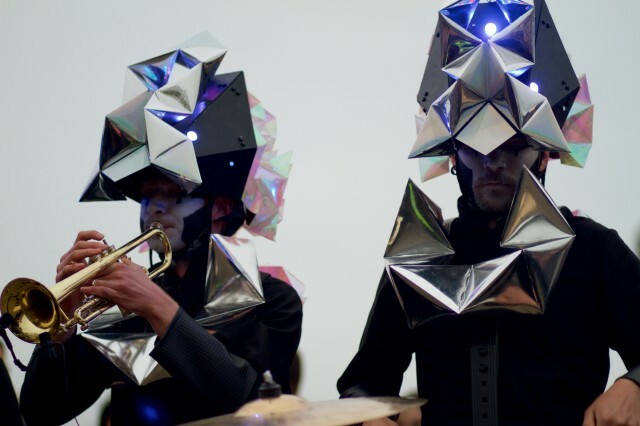 Above: As the city reverberated with live performances, The Harlequin Dynamites returned to LightNight with the sci-fi inspired Hex// Light DiVision. The live show travelled from the Anglican Cathedral to William Brown Street, via the Pier Head and University Square. Above: Liverpool’s affinity with decorated animal sculptures continued this year: following on from mini-Lambananas and Penguins, it is now the turn of the AquaDucks through #LiverpoolDuckTrail. 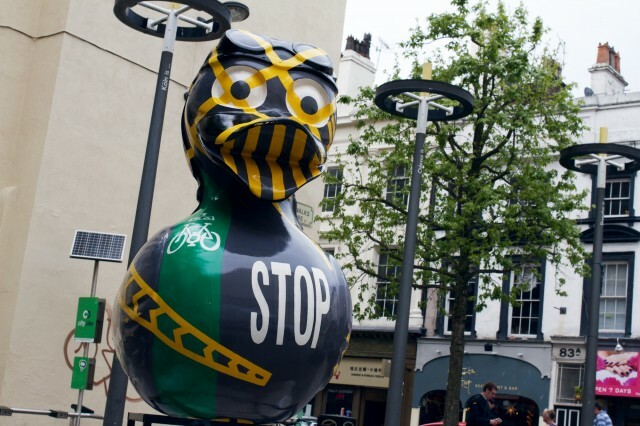 A set of 20 themed ducks have been placed across the city centre in aid of MacMillan Cancer Support.